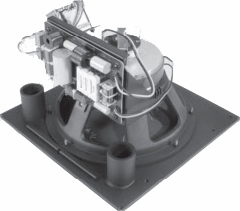 JBL Control 322C Ceiling Loudspeaker DJParts - All Variety of Parts that DJ Needs.  Components • Kevlar-reinforced 300 mm (12 in) woofer with 75 mm (3 inch) voice-coil cone.  • Medium-format compression driver.  Power handling of 400 Watts with high sensitivity provides high SPL capability. Component features include a Kevlarreinforced low frequency cone for reliability, well-damped surround for smooth frequency response, high temperature 75 mm (3 in) voicecoil and a reduced distortion design through saturated-gap magnet geometry. The high efficiency medium-format high compression driver features a radial slot phase plug for a smooth, extended high frequency response, along with a neodymium magnet for low installation weight. The Control 322C and Control 322CT are easy to install. The innovative EZRail™ feature built into the metal baffle temporarily holds one side of the speaker baffle in place until the installer can affix the baffle to the backcan with screws. The removable multi-pin locking connector, with secure screw-down terminals, allows for pre-wiring the input wires for easy clip-on convenience during installation. The clean, contemporary look of the optional MTC-300SG12 square grille is designed to suit high-end venues, offering a simple, elegant appearance that fits into a wide variety of décors. The optional, best-in-class, MTC-300BB12 three cubic foot backcan is made of extrathick 16 gauge steel and lined with 12 mm (½ in) medium density fiberboard to provide the performance of a top quality wood loudspeaker cabinet in a metal backbox form factor. The transformer version Control 322CT comes with a pre-attached top quality, low saturation 100 Watt multi-tap transformer for use on 70V or 100V distributed speaker lines. To ensure long life and reliability, Control 322C/CT passes JBL’s 100-hour torture power test. Nobody in the industry has more deminading reliability standards. Crossover Network: 1.4 kHz, 3rd order (18 dB/oct) high-pass plus conjugate to HF, 2nd order low-pass to LF. Transformer Insertion Loss (CT): 1.0 dB typ. Transducers: Low Frequency Driver: Kevlar reinforced cone, 75 mm (3 in) voice coil. High Frequency Driver: JBL 2407H neodymium-magnet medium-format compression driver with 37 mm (1.5 in) diaphragm. Safety Agency Rating: Suitable for use in air handling spaces, per U.L.-2043, U.L. 1480, NFPA90 & NFPA70A In accordance with IEC60849 / EN60849 Transformer in CT model UL Listed per UL1876. Baffle: Metal, 366 x 366 mm (14.4 x 14.4 in), driver pre-mounted to baffle, ported, EZRail™ for easier installation to backbox. Baffle Attachment to Attach via either 4 corner holes M4 x 14 mm MTC-300BB12 Backbox: machine screws, or 6 side/end holes #10 x .75 in (19 mm) sheet metal screws. Grille Attachment to Baffle: 4 pcs 4 mm machine screws in corners. Dimensions (H x W x D): 366 x 366 mm (14.4 x 14.4 in) square baffle x depth from back of baffle of 223 mm (8.8 in) on 322C & 240 mm (9.5 in) on 322CT. Net Weight: 322C: 20.0 lbs (9.1 kg) 322CT: 22.0 lbs (10.0 kg) Shipping Weight: 322C: 23.4 lbs (10.6 kg) 322CT: 25.8 lbs (11.7 kg) Included Accessories: Ported baffle pre-attached, transformer on 322CT. Optional Accessories: MTC-300SG12 Grille, square contoured, white. MTC-300BB12 Backbox, 80 liters (3 cubic feet) MTC-300T150 Transformer, 150 W for use with 322C.